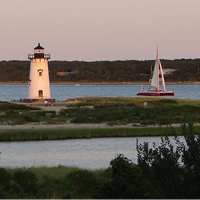 Martha’s Vineyard offers so much more than the beautiful beaches we are justly famous for! Boating and other watersports, camps, classes, horseback riding and fitness training are just a few of the many activities that are available on Martha’s Vineyard. Whether your idea of fun is swimming, hiking, kayaking, doing yoga or windsurfing on the waters of Nantucket Sound, Martha’s Vineyard provides you with the opportunity to pursue your passion. And there’s more going on indoors: take a culinary class that relies on local farms for its raw materials, explore woodcarving or pottery, hone your writing skills, visit a lighthouse or museum, watch art glass being created by Island artisan. Whatever your age, whatever your interest, Martha’s Vineyard offers you the opportunity to enjoy each day here to the fullest. If it’s not a beach day or you’re just in the mood for something a bit different, check out these great spots to picnic, watch the passing parade or play.